We ran to the hospital. On the way, we encountered hardly anyone, alive or dead. Where were they all? When we arrived at the hospital car park, I understood. Zombies were pack animals. A massive crowd of them were crammed in and around the main building like they were waiting for a concert to start, all barely paying attention to their surroundings and seemingly swaying against the force of gravity. The other thing was the smell. When watching horror films filled with shuffling zombies, the horror came from their ghastly looks—the reminder that death has a tight grip on us all, well, most of us. But what the filmmakers should focus on—if they could—was the acidic rank odor zombies gave off. They had been dead barely twenty-four hours. It took a normal human body at least thirty-six hours to really start to smell, and that was with a vampire’s heightened senses. These guys smelled like they’d been out in the sun for three weeks covered in rubbish and besieged by wily maggots. They were mostly intact, though. Maybe this hospital had been Zombie Ground Zero. Most had turned so quickly their comrades hadn’t had time to feed. Thank you to all the authors who contributed copies of their books. And a special thank you to http://month9booksblog.com/productscat/young-adult/ for their contributions. Would you like to be a character in the Battle of the Undead books? Well here's your opportunity! Nicky Peacock is giving away the chance for you to create a character of your very own to star alongside: Britannia, Nicholas, Josh, Jack and all the others in the next novels. You could be immortalized forever in a YA book! 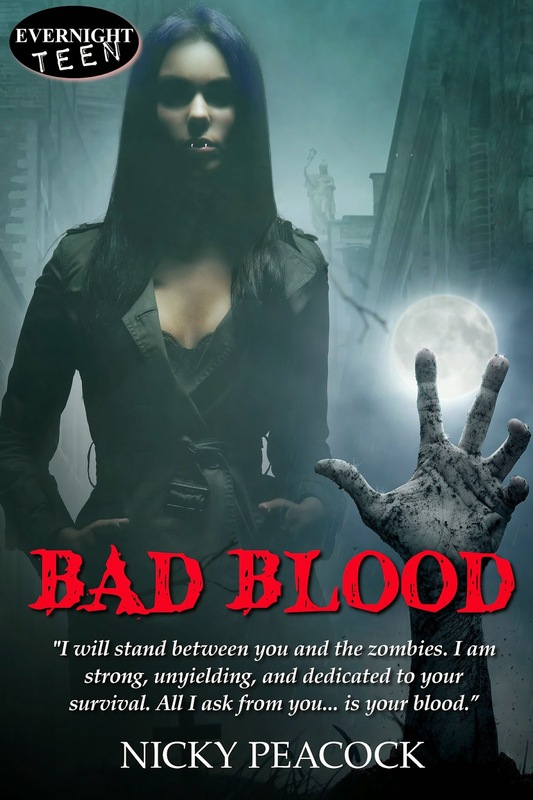 All you have to do is send an email entitled 'Bad Blood Character Giveaway' with your character on to: battleoftheundead (at) hotmail (dot) com Please include their name, gender, description, and whether they are a vampire, zombie, Vambie or human - and don't forget to say whether they are good or bad. Nicky will choose the best character and get in touch with the winner directly. Deadline for entries is the 30th November 2014.